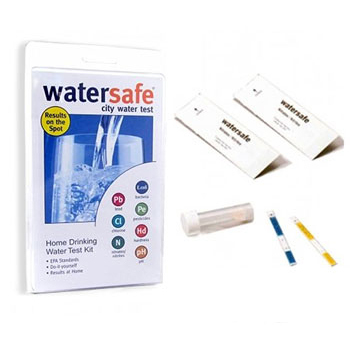 WaterSafe City Water Test Kit WS 425B. Comprehensive at-home water test that will show if your drinking water contains unsafe or undesirable amounts of one or more of the following 8 contaminants: Bacteria, Lead, Pesticides, Nitrates, Nitrites, Chlorine, pH, and water hardness. Test for 1 water source. 2. Do not open packets or a vial until you are ready to perform the tests. 3. Do not use on hot water or water containing bleach detergents. 4. Do not re-use any part of the test kit. 5. Read and follow all instructions carefully. 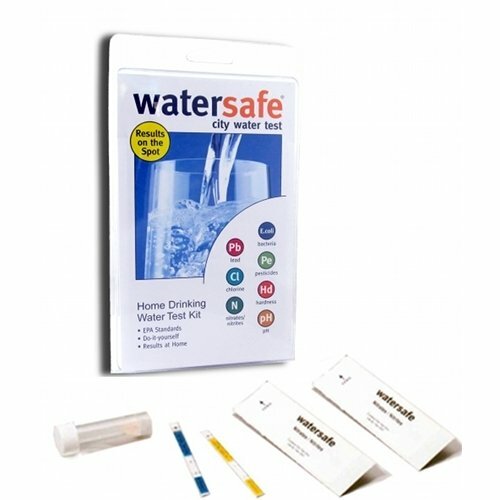 WaterSafe City Water Test Kits WS-425B for tap drinking water are using up-and-coming technology of test strips for accurate at-home water testing. They are fast, affordable, and provide lab quality results in comfort of your home within minutes (except bacteria test). With WaterSafe WS425B All-in-one Drinking Water Test Kit, you can learn many things about your tap water: find if you have hard water, detect high amounts of chlorine, check if lead levels are unusually high, see if your water is acidic, alkaline or balanced via pH test. Have your own well? Try Well Water Test Kit, or for more detailed results 15-contaminant Water Quality Test Kit. My father is a big fan of FilterWater.com. When I was expressed an interest in testing my water he recommended this product to me. It’s perfect for checking up on your drinking water. He and his friends rave about this test kit, and I’m sure if they were more computer savvy that they would be placing a positive review as well.